I have an unnatural love of disco for someone my age. The disco sound is summed up with the thumping and hypnotic bass sound. Whether it was produced by an actual bass guitar or a synthesizer doesn’t matter. Bassists really have the disco era a lot to owe for the furthering of their craft. Buy my T-Shirts designs for Bass Players, Bass Guitarists, Bassists Tees. 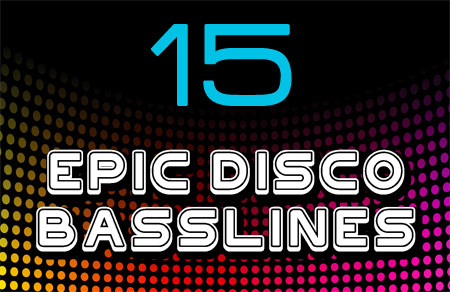 Here are 15 Disco Songs with Epic Basslines. I’ve decided to present the clips of these songs with YouTube musicians covering the bass lines so you can focus on the groove and watch their fancy finger work. Just about every song off the album ‘Off the Wall’ has impressive bass lines, save for the ballads especially ‘She’s out of my life’. I remember listening to the cassette version of this album over and over as a littlie, I think we even made a copy of the original, you know for preservation’s sake. The end of the fantastic movie ‘Despicable Me’ brought this song to a whole new generation. Hey this guy has put the tab notation up for the main riff .. no excuses it’s a simple line. A fast tempo number that requires quick finger work on the bass. This song is hypnotic in that it puts most people into a trance and steers them directly onto the dancefloor to do what they should be doing – dancing. Another hat tip to the final scene of Despicable Me! I saw Robin Gibb a year before he died and he sang this, the falsetto that his brother Barry would have sung was picked up by the female backing singers and it sounded pretty ace live, especially the guitar solo in the middle. This is quite a repetitious bass line but I think thats why it works so well. This is a drunken stalwart at all family gatherings especially weddings. On the dying fringes of the disco era, Diana Ross pops out this amazingly catchy song. This song is my second favourite Diana Ross solo effort, the first being Chain Reaction as it has such a great music video and the BeeGees writing the song and singing backing vocals, what more could you want? The guy in this video is playing a 5 string bass like a boss. I’ve come to terms that I’ll never get to see Michael Jackson in concert, (excuse I was 12 the last time he toured Australia and the tickets were probably 3 years pocket money). So the next best thing was to see his brothers in concert as ‘The Jacksons’. Michael’s absence was noticeable but they can still hold their own. Its rare to go to a concert and see everyone dancing the whole time but the momentum was just so impeccable. It comes with being seasoned performers. It was so good they didn’t bother coming back on for an encore. I’m starting to think this guy has a thing for 5 stringed basses. It’s such a huge disappointment to me that Donna Summers passed away before I had a chance to see her in concert. When it comes to Disco, she will always be the reigning queen. This song has the quintessential disco whistle blowing. I think a whistle might even be easier to play than the triangle. Unashamedly (or perhaps ashamedly) I saw KC & The Sunshine Band in Las Vegas a few years ago. In my head I had the image of a long haired relatively good looking KC bopping away behind the keyboard. Um, yeah that was over 30 years ago, people age. Out comes a bald, bloated guy who puffed himself out when he tried to move on the spot while singing. When he left the keyboard to dance solo it was just plain embarrassing. Only the stellar backing band and dancers and the complimentary cocktail voucher saved the night from being a total disaster. I grew up listening to ABBA records (thats the old fashioned LPs) as my dad is a fan so all their songs are strangely familiar to me. This is my favourite because its the most disco sounding. Madonna even sampled it in her 2007 song ‘Hung Up’. Total respect to the guy in the video, this would not be an easy song to play because of the tempo. I also like the drum and bass solo in the middle. Ok, so they were brought to you by the same genius fraudster behind Milli Vanilli. Does it really matter? I had to show this original video as no bass cover would do it justice. Look at the lip syncing, the splits and the fact they are all high as kites. Apparently they are touring Australia in June, although it will no doubt be at some small venue with overpriced tickets – it also wouldn’t be the same without the lead Bobby Farrell who died in 2010. Another German outfit, the lyrics aren’t deep but it makes it easier to remember if you are drunk. A bass cover couldn’t be found for this song, so here is a not so great live version of the song. Missed any? What would you add? Enter in the comments below. No mention of Boogie Oogie Oogie? It’s one of the most iconic bass lines of the disco era! Nice article. The bassline on Michael Jackson’s song “Off the Wall” is my favourite. So funky! Hi, Fun stuff, Two quibbles: 1) The fact that KC has doubled his weight, yet still keeps dancing like no one is watching is totally cool. He even makes fun of how he looks, so we should laugh along with him. 2) Madonna sampled “Gimme Gimme Gimme” on her song “Hung Up”.